Leonard Hart was born December 26, 1758. His father was Valentine Hart. Leonard Hart was one of the early settlers on the Watauga River in what became Tennessee. In 1807, Leonard bought land from the Seviers and settled on the farm next to the Hendrix Family. Leonard Hart may have been a Revolutionary War soldier and possibly participated in the battle of King’s Mountain. He was a surveyor and was appointed to survey the road from Shoals to the Holston River. He married Sallie Goodman (or Mollie) about 1784 in Sullivan County, Tennessee. Leonard and Sallie's children were born in Sullivan County. 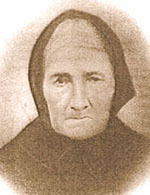 Elizabeth Hart Crow was born February 25, 1784. She married Isaac Lincoln Crow on April 1, 1832. John Hart was born August 08, 1786. 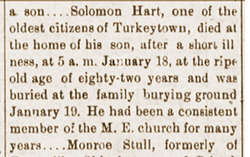 He in died in 1847 in Sullivan County. Sarah Hart Mottern was born October 11, 1788. She married John Mottern in 1804. Polly Hart Nichols was born December 11, 1790. She married John Nichols. Susanna Hart Hendrix was born March 6, 1793. She married Solomon Hendrix on March 01, 1812 in Carter County. They lived on his father's land. Solomon was a captain in the militia and served in the war of 1812. Isaac Hart was born May 23, 1795. He married Martha Tipton the daughter of William Tipton. On February 1, 1796 Leonard obtained 239 acres in Sullivan County. William Hart was born September 11, 1797. Andrew Hart was born March 27, 1800 in Sullivan County. Catherine Hart Hendrix was born June 21, 1802. She married William Hendrix on August 06, 1820. Leonard Hart, Jr. was born June 25, 1806. He married Catherine Emmert on March 27, 1826. Catherine was born April 23, 1808. She was the daughter of George Emmert, Jr. and Margaret Shawley. Solomon Hart was born on March 22, 1808. He died on July 18, 1895. Abraham Hart was born on May 14, 1811. He married Mary Crow. Fern Hart Combs was mentioned as a daughter in Leonard's will. She married Jonathan Combs. In 1814 Leonard Hart was a member of the Carter County court which decided to buy salt to resell with the state lottery proceeds. On July 8, 1819, Leonard married Phebe Webb. She was born on 1769 in New Jersey. She was the daughter of Benjamin Webb and the widow of John Proffitt. The 1820 manufacturer's census listed a pottery owned by Isaac Hart and John Mottern. The pottery continued until the early 1870s. They appeared in the 1850 census in Carter County. The household consisted of Leonard Hart age 91, Pheobe Hart age 81, and Nancy Proffitt age 10 or 16. Leonard Hart died in 1852 and was buried in the Sinking Creek Baptist Church Cemetery. Henry Little was the executor of the estate. Johnson City, Tennessee is in Washington, Carter and Sullivan Counties. It was known as Brush Creek for the Creek than runs through it. Christina Moltern was the daughter of John Moltern and his wife Sally Hart. Sally Hart was the daughter of Leonard Hart and his first wife, Sally Goodman. Leonard Hart was a Revolutionary War Soldier; he was with the King’s Mountain patriots. He was a surveyor and was appointed to survey a great road from Shoals to the Holston River ...". A trammel an arrangement of links and a hook in a fireplace for raising and lowering a kettle. Tools were an important legacy because they were essential part of daily life. My wife Phebe Hart is not to be disturbed but to have peaceable possession of the dwelling house and all the furniture both in house and kitchen during her life time but at her death or her removal from said residence then the said furniture not herein bequeathed to her is to be sold and the proceeds applied as here before stated. hereby revoking all former wills by me made in witness whereof I have here unto set my hand and affixed my seal this 7th, day of February 1849. Cattle were vital to a household and an important legacy. Female cattle are heifers and cows (had a calf). Male cattle are steers (castrated) and bulls. Oxen are trained draft animals and are often castrated adult male cattle. An indenture is a legal contract for labor or land. Two copies on the same sheet were separated with a jagged edge so that the two parts could be refitted to confirm authenticity. An indentured servant worked without wages for a specified time to pay a debt and was bound to the employer. 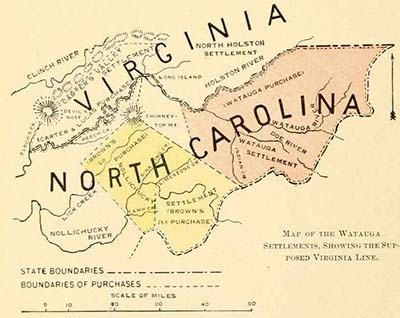 In the 17th century, nearly two-thirds of settlers came as indentured servants to pay for their passage. Testis (Test) is latin for witness. Testes is the plural. Carter County, Tennessee was organized from Washington County on April 9, 1796. Elizabethton is the county seat.